This set of Genetic Engineering Questions and Answers for Aptitude test focuses on “Co-expression of Proteins and Optimization”. Explanation: If it is desirable to express two or more proteins simultaneously, then it is called as co-expression of proteins. There are varied uses of such proteins. 2. For co-expression of proteins, it is possible to have several independent sets of promoters and other signals in a single vector. Is the given statement true or false? Explanation: For co-expression of proteins, there are two strategies which are used. The first is to use several different expression vectors at a single time. The second method is to use several independent sets of promoters and signals in a single vector. 3. A considerable amount of modification can take place in the ______ region of RNA in _______ before translation. It affects the yield of proteins. Explanation: A considerable amount of modification in the coding region of the RNA can take place in eukaryotes before translation. This can have an effect on the yield of the protein. Explanation: It is not necessary that if transcription and translation initiate well, they continue well. Factors such as secondary structure, affect translation. There are other factors such as codon usage and codon meaning which affect translation. 5. What is the function of T7 lysozyme? Explanation: T7 lysozyme is used for reducing the level of expression from T7 promoters. It is phage encoded and serves a dual purpose. It attacks the peptidoglycan in bacterial cell walls and is inhibitor of T7 polymerase. 6. As the activity of T7 polymerase is reduced by lysosome, what is effect on the rate of synthesis after induction? Explanation: As the activity of T7 polymerase is reduced by the lysosome, resultantly the rate of synthesis after induction is also reduced. Explanation: Proteins are not always soluble and at times they form insoluble aggregates. These are called as inclusion bodies. It is to separate them out by centrifugation. 8. It is not possible to solubilise proteins from aggregated mass of proteins. Is the given statement true or false? Explanation: At times, it is possible to solubilise proteins from the aggregated mass of proteins. And this further helps in correct folding. 9. Lon protease is used for degradation of foreign proteins in E.coli cells. It is active against which type of proteins? Explanation: Lon protease is used for degradation of foreign proteins. It is active against both partially and completely denatured proteins. Explanation: Lon mutation can lead to problems such as mucoidy and UV sensitivity. Mucoidy is the phenomenon overproduction of polysaccharide capsules in the cell and thus manipulation becomes difficult. Explanation: Mucoidy is undesirable for physical manipulation. It can be suppressed by mutation in gale gene or cspA-E gene cluster. 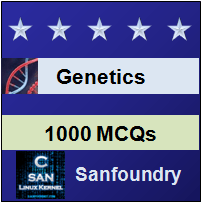 To practice all areas of Genetic Engineering for Aptitude test, here is complete set of 1000+ Multiple Choice Questions and Answers.